So, this giveaway runs from December 15th to Christmas day. On the 26th, I will choose 3 winners to recieve your choice of one of my ebooks (PDF format). Click here to see the choices. You’ll also be entered for a chance to win a Kindle Fire and a $20 Amazon gift card as the grand prize, WOOT! And don’t forget to stop by the other authors participating to win other awesome prizes as well. What’s your favorite part about the holidays? That’s it. Leave your email or check back on the 26th to see if you’re one of the winners. The Grand Prize will be drawn. 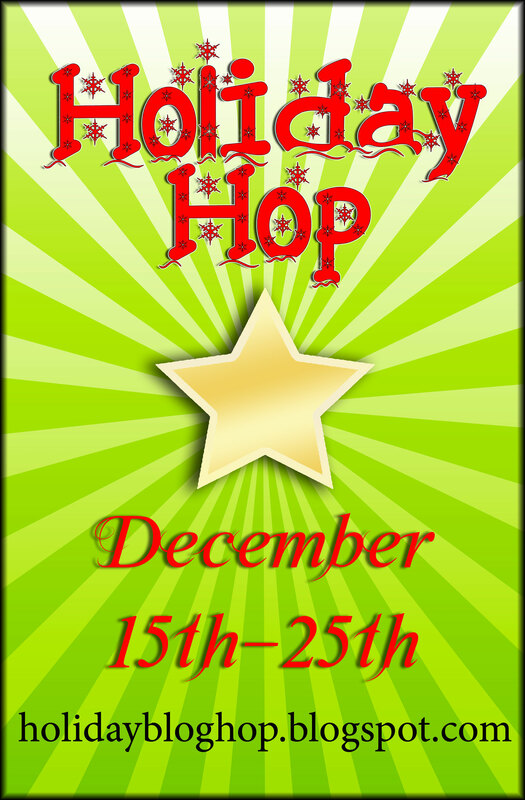 Posted on December 15, 2011, in Blog Hops, Giveaways and tagged amazon, Blog Hop, christmas day, Gift Card, Giveaway, grand prize, Holdiays, Kindle Touch, prizes. Bookmark the permalink. 33 Comments. Woo! Hoo! I’m the first to leave a comment! Hi Amber! Happy Holidays! I follow thru Network Blogs as Renee Bennett. My favorite thing about the holidays is seeing how nice people get during this time. I know that after the holidays, people go back to being self absorbed and selfish, but at this time, people give to those that are unfortunate, become much more polite and helpful. I just wish people could be like that year round. I’m a NWB follower and an email subscriber. Love your books and your blog! My favorite part of the holidays is watching Christmas themed movies all day long on Christmas Eve with my husband, boys and this year, my new daughter-in-law. We snack and sip on egg nog and hot chocolate and laugh and enjoy each other’s company and just revel in the fact that the Christmas rush is done and we can all just sit back and enjoy each other. Thanks for this wonderful and generous giveaway op! I follow you as Lena M. via WordPress and as Lena Maxwell via NetworkedBlogs. Since time is precious, I try to adhere to the magic of the holiday season all year, BUT! My favorite Holiday pasttime has to be when my husband’s and mine extended families all get together to eat, drink, and share our mutual affections for one another! It’s great to be alive! I am a new follower, email subscriber and i am very exited to have discovered your work =). For a second there i though i was hallucinating and then i realized it was little snow flakes on the page hahaha so nice touch it definitely puts me into the holiday spirit. But yea speaking of the holidays i think my favorite part of it is spending it with my family because since i am away in college i dont see them much. so yea those are my kind of things, wish you and yours also have a great time and happy holidays!!! Great holiday blog hop. Thanks. My favorite part about the holidays would half to be all the holiday specials and movies. I could watch them all year. my favorite thing about the holidays is spending time with my nieces and nephews making candy and cookies and watching christmas movies. Would it be bad to say all the time off work that i get??? At least 5 days in a row that i get paid for without being there….oh yeah…..
My favorite part about holidays are the food and gifts. Of course, also seeing my relatives, but the top is food. Even though it makes me gain weight, knowing the usual food that we eat on that specific holiday is still there makes me happy. Focusing on love toward family, God, and nation. We seem to forget that love is the ultimate strength that fiber that holds families and nations together. It is awesome to just spend time together with family/friends and relax, enjoy life, and forget about our daily lives. Holidays should be used to reflect back on how this nation and we are blessed and be thankful for it all. I love all the family get together’s. Between my relatives and his, plus our own kids, we end up with about 5 big dinners together. Love the food, the gossip and the laughter of all of us getting together. My family has a tradition that every year on Christmas Eve we get together and have a big huge party where we do a White Elephant gift exchange. The fun part is that we all love the movie A Christmas Story so we all chipped in and bought a leg lamp like from the movie. So every year one of the white elephant gifts (whoever is hosting the party that year does this) has a leg sticker on it. Now you can steal someone elses gift or opt to open a new one and if someone steals your gift you get to do the same. Needless to say it gets really hectic and crazy but we all have tons of fun with it and the rule is whoever won the lamp the year before has to host next year and can’t win it that year. It’s not really about the lamp or anything it’s just a lot of fun and we all get together and have a blast. My favorite Christmas memories come from those parties. My favorite part of the holidays is FAMLY! This year we get to see my mom, gram, and stepdad; not something we have done in a LONG time due to hubby’s work schedule! I love getting together with my family and seeing the kids open their presents. My favorite part of the Holidays is seeing all my family at once and sharing a festive mood. Signed up for your blog as well 🙂 Thanks! I love the holidays because i get to see all of my family and have great food!!!!!! plus theres just something about being in a room full one love and happiness. I am now a follower! My favorite part of the holidays? When they are done. Thank you so much for the giveaway. I hope you have a joyous and safe holiday season. My favorite part about the holidays is getting together with my family at my sisters and stuffing ourselves then rounding out the day playing board games. My family loves to play games. They don’t like to loose, but they love to play. Unus Sed is following on FB through Network blogs! I love driving around town checking out all the lights. I love spending time with family…..and Christmas cookies! I followed through email, networked blogs and twitter. Either by dawnmomoffour, Dawn Doyle or thedoyle6. Hi! Merry Christmas! Thank you for the wonderful giveaway! My favorite things about the holidays is seeing my family and spending time with them. Thank you! I am now following you. Favorite part of the Holiday’s….Family and Friends. oh and animated cartoon specials.